True Economics: 20/6/15: STEM to Bull: Time to Rethink Irish Tech Propaganda? 20/6/15: STEM to Bull: Time to Rethink Irish Tech Propaganda? So we are being told there are brilliant opportunities available in employment in Sciences, Technology, Engineering, & Mathematics (STEM) fields in Ireland and that the demand for workers in these sectors is outstripping anything anything else. As always, reality is a bit more complex than the wholesale sloganeering suggests. As you can see from the above, STEM-related occupations are not exactly homogeneous... Take Human Health, where there is very severe rationing of medical degrees and education opportunities coinciding with falling earnings. 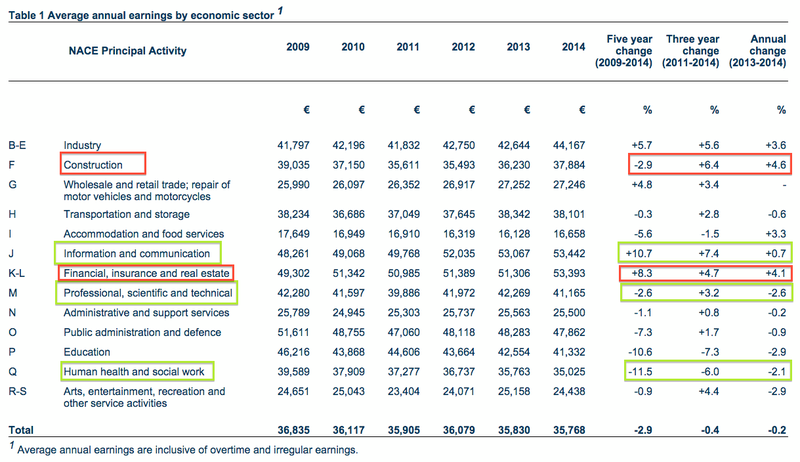 And look at non-STEM sectors, like Finance, where there are growing earnings. Next, take pharma sector - a core STEM sector where, allegedly, there are plentiful employment opportunities in Ireland. 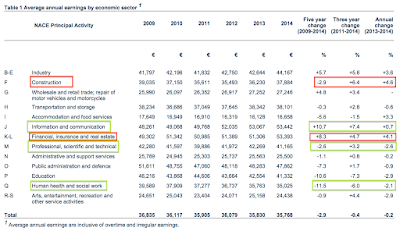 Per Enterprise Ireland: "Employment in the sector has grown from 5,200 in 1988 to 25,300 in 2010" (http://www.een-ireland.ie/eei/assets/documents/uploaded/general/Pharmaceuticals%20Fact%20sheet.pdf). Which sounds impressive. Between 2006 and 2013, employment in the sector (primarily containing pharma sub-sector) has dropped, not risen, going from 29,010 in 2006 to 23,948 in 2013. And do note: Enterprise Ireland document linked above attributes all jobs in the Checmical & Pharmaceutical sector in 2010 to Pharma sub-sector. Which, of course, is clearly not the case. Do we really want to treat STEM as a 'panacea' for incoming new students and for the economy? Or should we stop propagandising individual sets of skills and support students best matching their ability and interest to educational offers? After all, call me old-fashioned, but a good writer is infinitely more productive (and socially valuable) than a bad engineer or a discouraged coder.